This attractive Renaissance portrait can be attributed with some confidence to Nicolas Neufchâtel, one of the leading portrait painters working in Germany in the 1560s and early 1570s. The use of a simple yet dignified pose, the sober but rich display of material wealth, and the clear plasticity of form heightened by a strong lighting effect against a monochrome background – all visible in our painting – are usual features of the artist’s manner. In addition, the quality of the drawing and the level of detail are admirable: the sitter’s impressive full beard and short moustache were achieved by long, fine strokes of pigment – practically painted hair by hair. The likeness also shows a certain psychological insight: whilst the sitter’s gaze seems to softly connect with the viewer, it conveys a sense of patrician confidence. Indeed, given the lavishness of his costume he is wearing an elegant black, fur-lined gown he must have come from the upper echelon of society. The sophisticated arrangement of his hands and gloves in the lower right foreground serves to confirm his social standing. The great majority of the fifty or so extant portraits by Neufchâtel represent sitters from Nuremberg. Our gentleman may have resided in that city, but certainly in Southern Germany. Nicolas de Neufchâtel, also known as Colyn van Nieucastel, Nicolas de Novocastello or Lucidel, was born in Mons, Belgium, possibly in 1527. He was active in Germany. In 1539, he was recorded at the Antwerp Guild as a student of Pieter Coecke van Aelst. 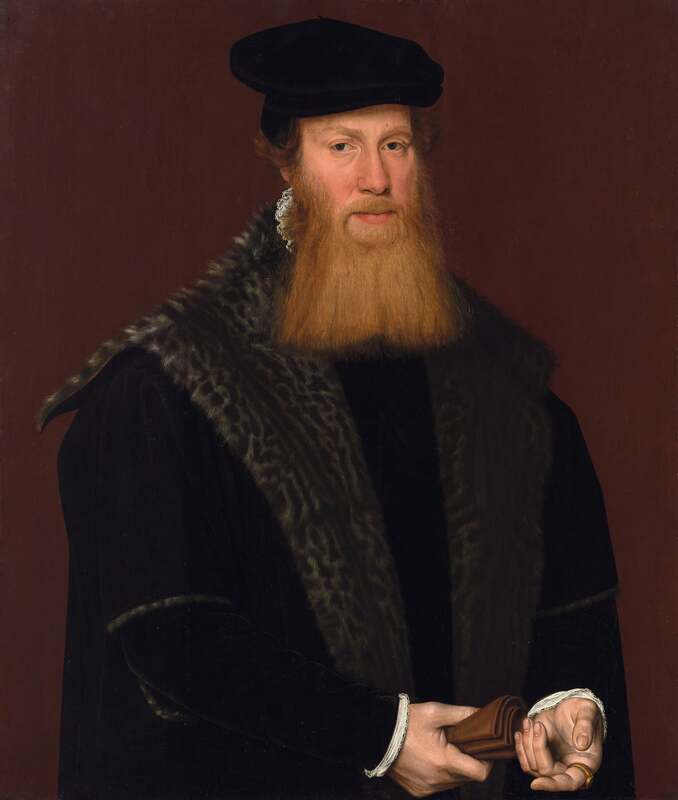 From 1561, he is recorded in Nuremberg and seems to have remained there at least until 1573, the date of his portrait of Johann Gregor van der Schardt (Trieste) after which there is no further trace of him, although his influence on Nuremberg painters was to last for two generations thereafter - his main follower, Nicolas Juvenel, closely imitated his style. Neufchâtel is known to have been a Calvinist with militant fervour. All of the painter’s known works, including a few attributed drawings, were produced between 1561 and 1573. He was one of the most successful portraitists of his time, owing to his ability to combine the warm, atmospheric quality of Flemish portraiture with the clarity and physical presence typical of German portraitists like Christoph Amberger. His sophisticated portraits appealed to Netherlandish émigrés and the local Nuremberg elite alike. Many of his likenesses depict couples, the finest being that of Hendrik and Margaretha Pilgram (Museum of Fine Arts, Budapest). Occasionally, Neufchâtel personalised portraits by inserting references to the sitter’s occupation or interests. We are grateful to Prof. Jeffrey C. Smith (University of Texas at Austin) for confirming that there is ground to support an attribution to Nicolas de Neufchâtel. The painting compares well with the autograph half-length portraits in the Museum of Fine Arts, Budapest, and the Alte Pinakothek, Munich. Neufchâtel’s work is featured in other important public collections, such as the Royal Museum of Fine Arts, Brussels, the Statens Museum, Copenhagen and the Hermitage Museum, Saint Petersburg. Jeffrey Chipps Smith, The Grove Dictionary of Art, entry on Nicolas Neufchatel. Email to The Weiss Gallery dated 27 February 2008.